Neal Spafford of Spalding receives his red card towards the end of the draw with Gresley. Photo: Tim Wilson. Spalding United aim to take their weekend frustrations out on Evo Stik Division One South basement boys Rugby Town tonight (September 27). The table-topping Tulips led 2-0 against fellow unbeaten side Gresley at the Sir halley Stewart Field on Saturday (September 24) before being pegged back, ultimately by a harshly-awarded last-minute penalty. Spalding celebrate a goal against Gresley. Photo: Tim Wilson. The disappointment of that controversial decision was compounded by a red card for Neal Spafford, although the point from a 2-2 draw was still enough to keep Spalding top of the table. Dave Frecklington’s men will expect to at least protect their two-point advantage by beating Rugby. Frecklington said: “We were outstanding against Gresley. It was the most one-sided game we’ve been involved in this season. “It was frustrating not to win after delivering our best performance of the season, but we can’t dwell on it. Action from Spalding v Gresley. Photo: Tim Wilson. Stamford AFC’s season in the same division has yet to take off. The Daniels are 20th in the 22-team league with just one win from six matches and they have a tricky trip to seventh-placed Bedworth this evening. 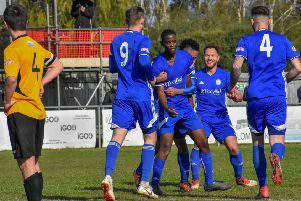 Deeping Rangers and Peterborough Northern Star meet in a juicy United Counties Premier Division match at Outgang Road tonight when leaders Peterborough Sports take on sixth-placed Wellingborough Town at PSL. Unbeaten Holbeach United are at mid-table Harrowby, while Yaxley travel to Sleaford tomorrow (September 28). Spalding United v Rugby Town. Eynesbury Rovers v Huntingdon Town. Peterborough Sports v Wellingborough Town.